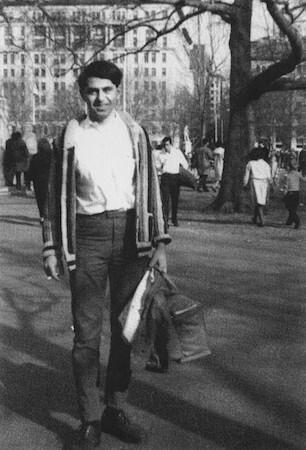 Joe Ceravolo in Washington Square Park, April 1964. Photo by Rosemary Ceravolo. and whiter and whiter and whiter. Silliman, who uses the example of “Migratory Noon” and other poems to support a theoretical point in his essay about the need for a fresh critical vocabulary for poems that resist ordinary thematic analysis, points to the strangeness of the devices that Ceravolo uses (such as the “singing” of a plea). However, the passage above does not require much effort for a reader to construct a plausible slice of narrative. The speaker, whether inside “the car” or out in the elements, wants to be rescued from the impact of wind and cold, and the whitening of “sky” indicates an increase in cloud cover or presages a snowfall. However, the pronoun used in the poem’s only question and final sentence makes it considerably more elusive: “Where are you / in the reincarnate / blossoms of the cold?” (31). 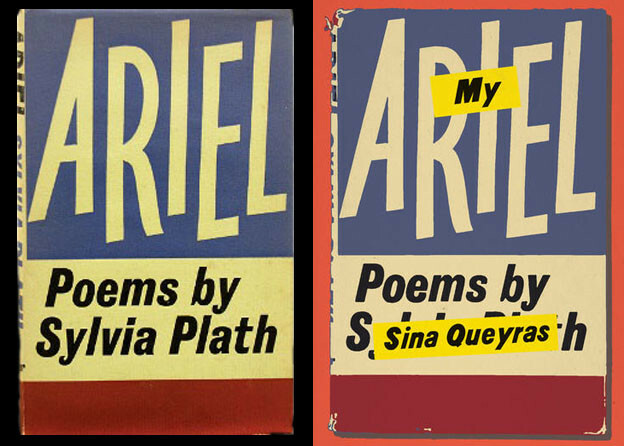 And how does the poem’s title relate to the poem? Silliman distinguishes between the function of “a title,” which “points or refers to the body of the text as a whole,” or of a titular “caption,” which “penetrates it highlighting certain elements within.” He asserts that Ceravolo’s false title, “Migratory Moon,” is a caption, prompting “a leap of faith that allows a reader to experience a cohering unity,” but when he reveals the actual title, he claims that “nothing within the poem is open to such a penetration.” The adjective “migratory” echoes Transmigration Solo, the title of the 1979 volume in which the poem was originally collected. Captioning particular elements of the poem, it can be said to refer to the fact that “cranes” (birds) and human beings like the speaker have a reason to migrate, given the cold of the wind. However, the fact that this adjective is tied to the noun “noon” may indicate to some readers, instead, that the title makes “the body of the text as a whole” — whatever narration lies within — be framed by a particular time. Thus, “noon” is a personification; it exemplifies multiple movements of elements within an environment. Silliman denies that either title or caption can be supported when it is discovered that “Moon” is actually “Noon.” However, given the accuracy of what he says in the essay about the pervasiveness of the Parsimony Principle, a reader determined to conceive of the correct title in either of these two ways will foreground elements that fit specific contexts and ignore those that disable such a reading, and these moves could easily prove persuasive to a constituency of readers. For example, one could argue that a title is a caption even if it lacks any words from the poem, because words in the title and poem might be considered linked by definition, metaphor, or metonymy. Putting the finishing touches on his opening critique of Peter Schjeldahl’s review of Transmigration Solo, which admits to “rarely” knowing what Ceravolo “is talking about” but trusting in the poet’s “felt contact with actual experience beyond the experience of words,” Silliman concludes his analysis of what is within the experience of words by asserting that Ceravolo’s poem is “a complex, unstable whole not equal to any single envisionment.” Though my own reading (which, unlike his, never considers the relation of the word “moon” to the poem) locates different potential clusters and disruptions of meaning than his does, I cannot disagree with his thirty-year-old summation. In the past three decades, what Silliman calls “the School of Quietude” and Charles Bernstein terms “Official Verse Culture” still express their discomfort at times with poems that severely splinter the readerly quest for envisionment. Nevertheless, so much has been written about Language Poetry and other innovative work that the kind of “final” characterization that Silliman offers has become commonplace, though the interpretive steps he takes to arrive at it are not. It might be useful for writing on Ceravolo in 2012 to trace the collision or confluence of competing emphases — for example, pastoral, amatory, aleatory, collagistic, theological, rhetorically hybrid, surreal, linguistically self-reflexive — and to speculate about how readers foreground effects that stem from these encounters of disparate elements. 1. Ron Silliman, “Migratory Meaning,” in The New Sentence (New York: Roof Books, 1995), 109, 119. 3. Joe Ceravolo, Transmigration Solo (West Branch, IA: Toothpaste Press, 1979), 31. 4. Silliman, “Migratory Meaning,” 112.